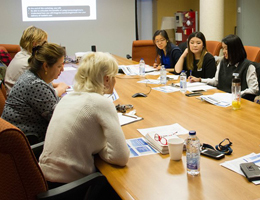 Community partners can benefit from the skills and enthusiasm of Faculty of Health students through a variety of experiential education (EE) opportunities. "[The students] definitely exceeded our expectations. They came with enthusiasm that was really great to work with." Investigate requirements for an employee accreditation tracking and management system. Support the formal evaluation of a mentorship program. 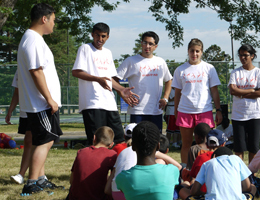 Lead play-based collaborative games to increase physical activity. Propose projects that support local organizations’ work around a global health issue. Support a health promotion program at a community health centre. 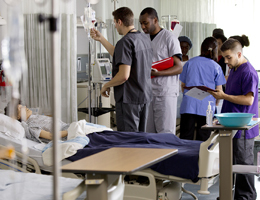 Visit our Gallery to see examples of experiential education in the Faculty of Health. Why should I engage in experiential education? There are around 9,500 students in the Faculty of Health, and they belong to one of our five degree programs in: Global Health, Health Policy and Management, Kinesiology and Health Science, Psychology, and Nursing. Experiential Education opportunities are curricular, which means that students engage in them as a requirement of a course or program of study. All students are expected to possess foundational knowledge related to their discipline. When you are connected with an EE opportunity, the EE coordinator or the course director will be able to tell you more about the knowledge and skills those particular students will be able to offer to your organization. In turn, by engaging in experiential education opportunities students will refine key competencies like: communication, teamwork, problem solving, civic engagement and critical thinking. You may contact the EE Coordinator if you have a project or initiative that would be a good fit for our students, or the EE Coordinator may contact you with an existing opportunity. We will work with you to ensure a mutually-beneficial experience. While each opportunity will be unique in its own way, there are some key considerations to think about. Are you considering an ongoing or project-based opportunity? What types of tasks (e.g. research, outreach, service, etc.) do you foresee students engaging in? What time commitment would you expect from students? Would students be required to keep regular hours? Are there any requirements (e.g. police checks, training) that students should be aware of? Would students work individually or in groups? Who would supervise the students? Will students need to work on-site in your organization or can they work remotely?